I was really excited when Mystic Pesto announced this blog hop. 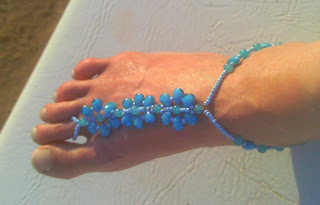 I love anklets and really like the barefoot sandal type of anklet. I knew I wanted to make a barefoot sandal but didn't want to make a plain one with just a basic color variation so, after looking through my bead organizers over and over, I finally decided on some beads and a vision of what I hoped to turn them into in my head and started stringing beads. 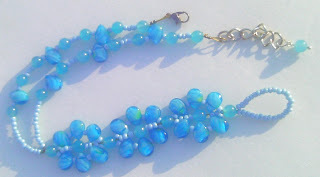 Amazingly enough, the pattern in my head only needed a couple of small changes and the anklet went together pretty smoothly, I was surprised and happy because "restringing" and "changing this and that" require patience, something I have very little of these days, lol. I also made a regular anklet. This color usually looks good against black so had to include it. 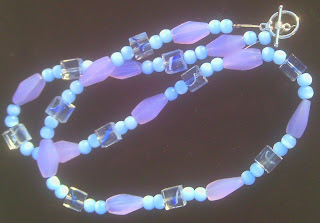 The beads I used making the barefoot sandal are some blue quartz drop beads, blue jade beads and blue seed beads. 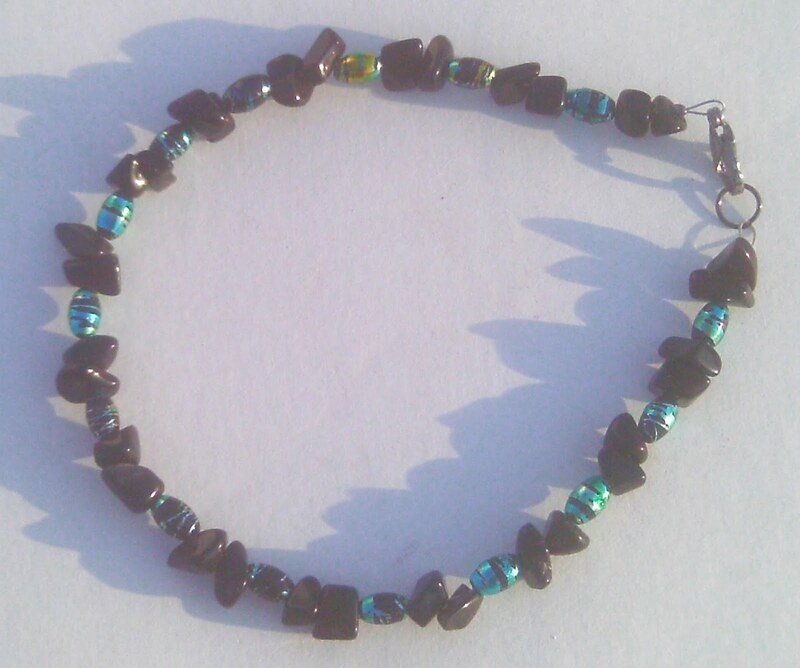 Then, I made a simple anklet using some black nugget beads and some black beads with a blue foil design. 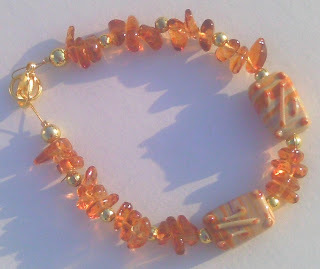 Please remember to check out the other anklets made for this blog hop. 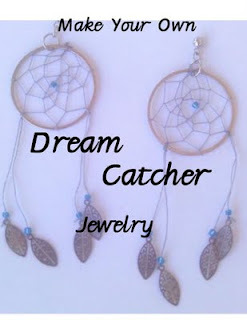 I have had a few people ask me if I knew where they could find a dream catcher tutorial. Since I didn't have a clue, I decided to write my own. This is my first tutorial and it's a lot more work writing one than I thought. I call this necklace Ice Cubes and Frost because the cube beads remind me of ice cubes and the other beads have a frosty look to them. 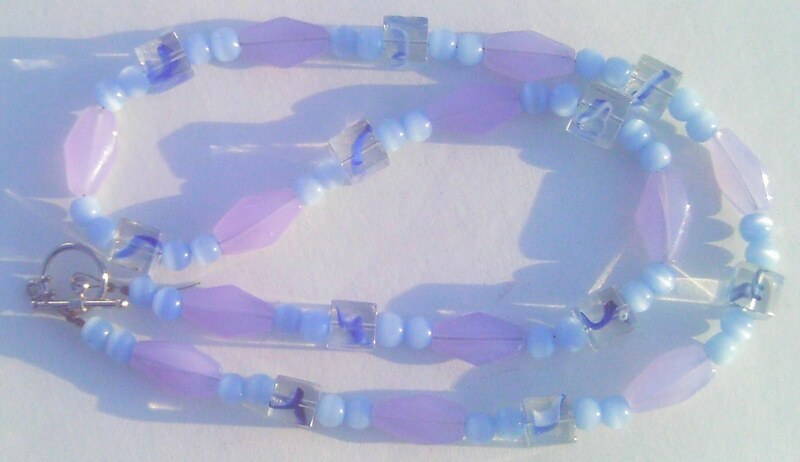 This necklace looks like it could almost cool you down on a hot summer day. 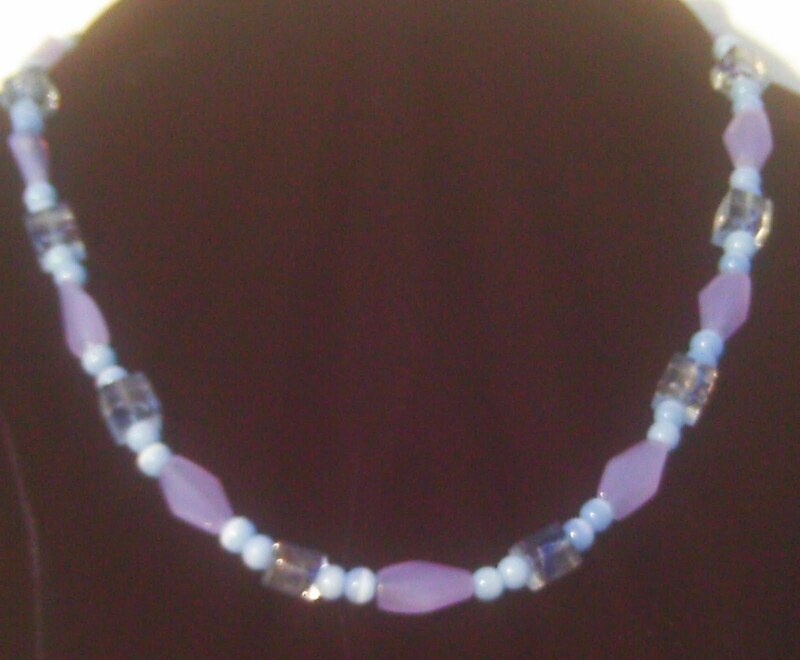 To make this necklace I used clear cube beads with a blue swirl inside, light blue cat's eye beads and blue quartz beads and a silver toggle clasp. I found some great rectangle beads that remind me of caramel candies. I used these beads along with some amber nuggets and silver spacers to create the necklace and bracelet. 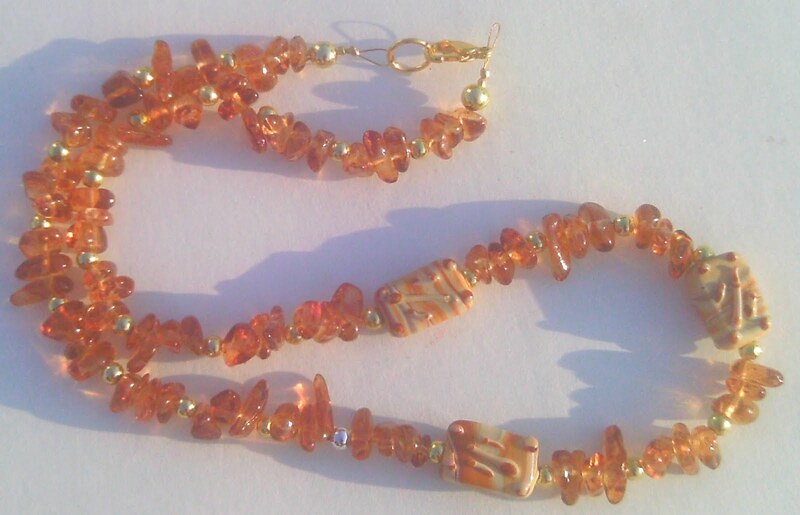 To make the earrings, I used the caramel candy beads and added amber drop beads and leverback ear wires. 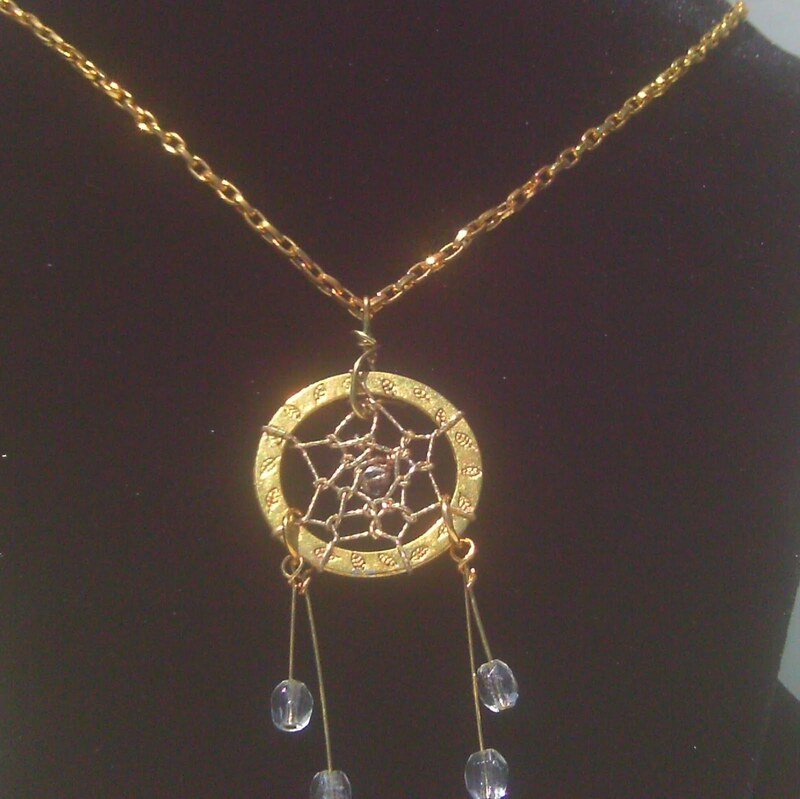 I am not quite sure if I'm going to keep this necklace the way it is. 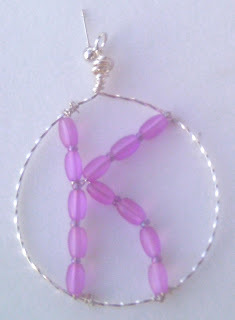 The two shorter strands look good together but I'm not so sure about the longest one. Anyone that wants to give their opinion, please do. 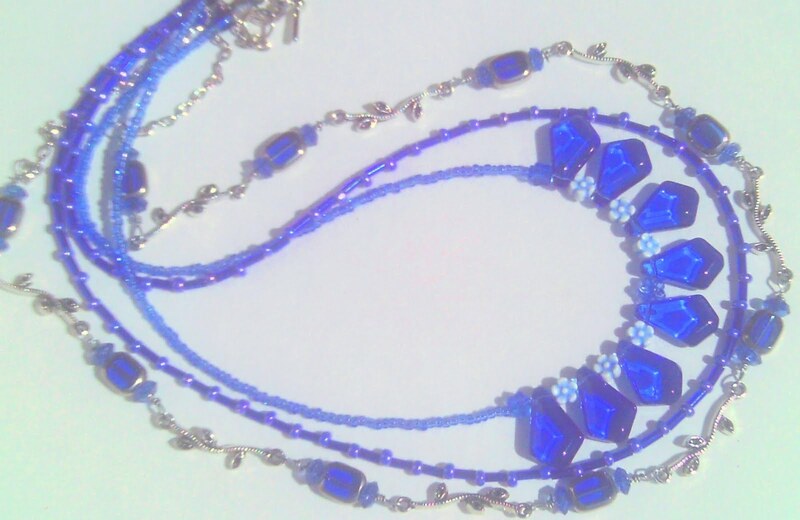 The shortest strand was made with blue tear drop beads, white flower beads, blue flower beads and blue seed beads and is 16" in length. The middle strand was made using blue bugle beads and blue seed beads and is 20" in length. The longest strand was made using silver branch links, blue window pane beads and blue spacer beads and is 24" in length. 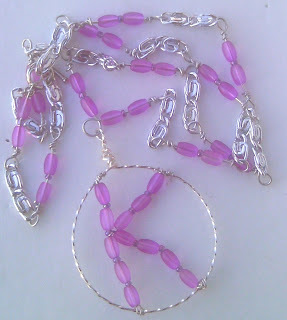 The necklace has a silver toggle clasp. Well, I was sick for a few days so...........they are finally done! 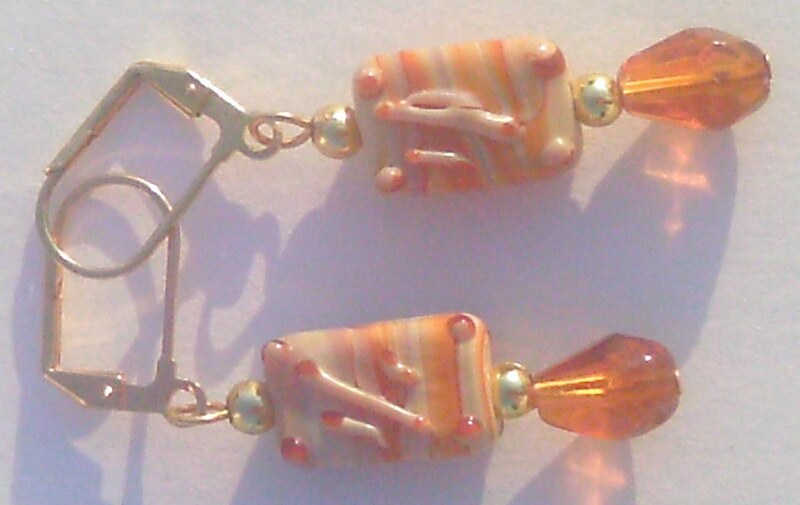 Earring.....yes, there are two of them, lol. I am just awaiting her approval...............keeping my fingers crossed. I have also just completed two anklets for the blog hop and want it to hurry up and be time to post them!!!! 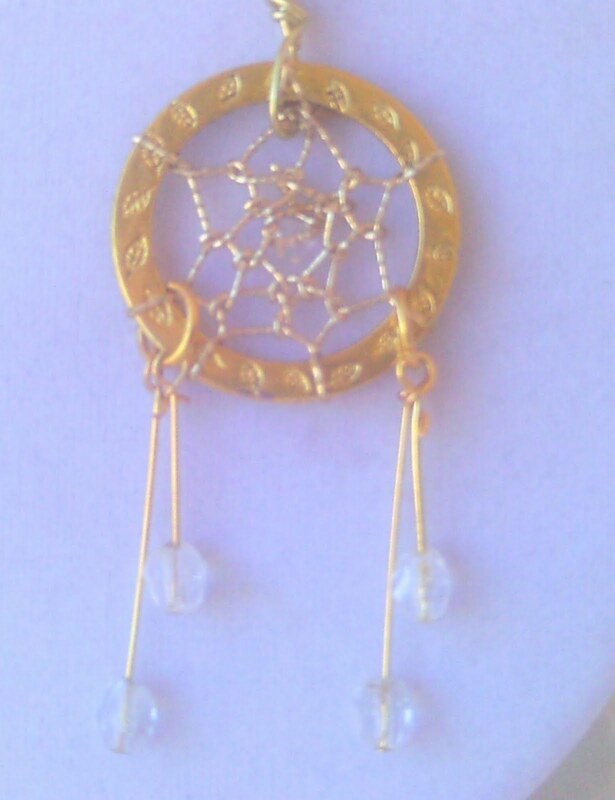 In my last post I showed the earring I had made to show my client. This is the one that I spent the most time on and the one that I thought the client would prefer. Well, I also made a couple of "simple" designs so that she would have something to chose from. Well, it's a good thing I did, because she chose either option 2 (without the dangles) or option 3. she did not like the first one at all. Well, tells you what I know. I will post the completed set when done. 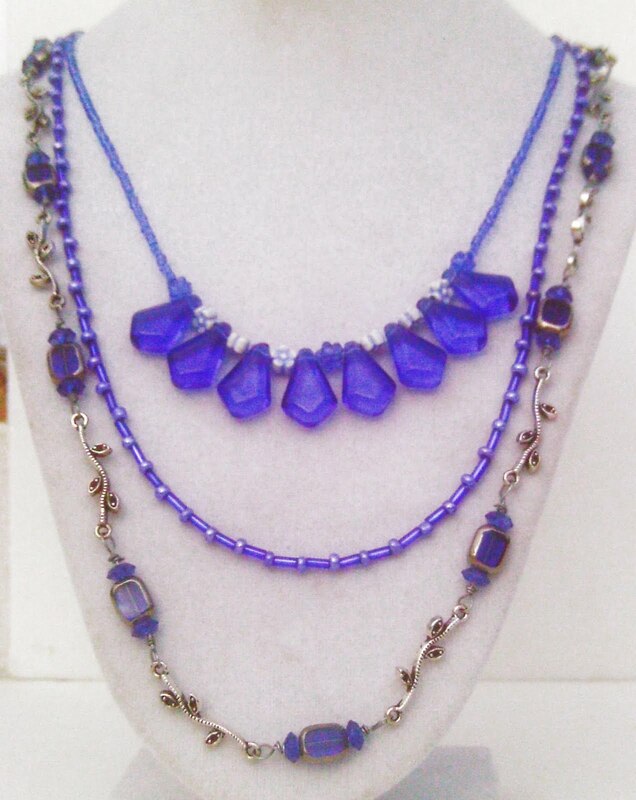 With custom orders, I like to email pics frequently so that both the customer and myself are on the same wave length with what the customer wants. 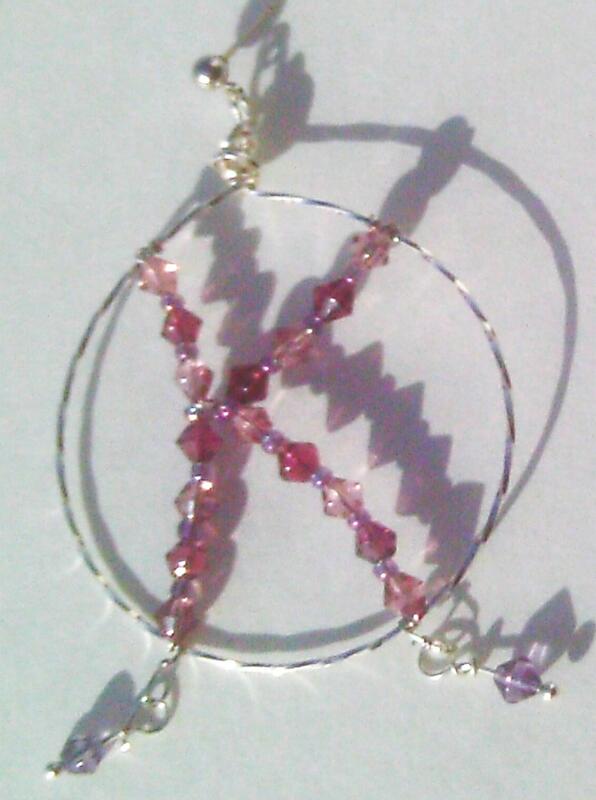 I completed one earring and have emailed it to her but as she is in Scotland and myself, the US, we are on different times so hopefully she will be seeing the email soon and get back with me. An online poker friend asked me what I could do in the way of Hoops. 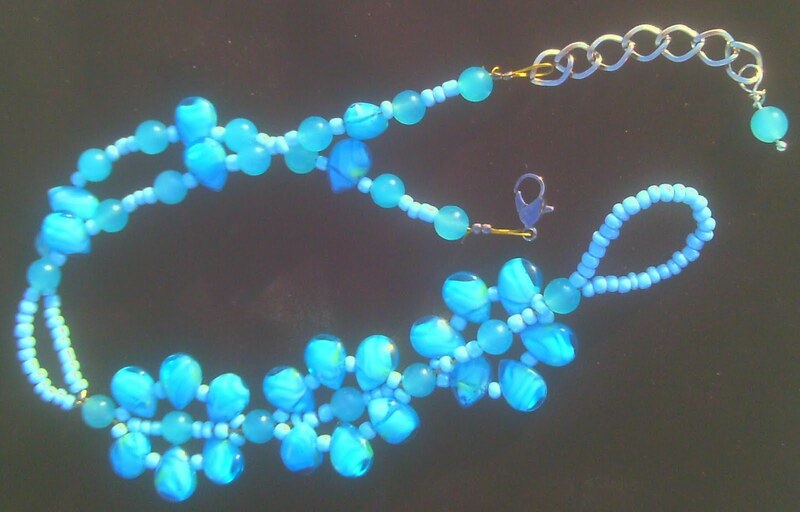 She was interested in earrings and a matching necklace. At that time I was in the process of making a new pair of Dream Catcher earrings. Since that pair of earrings was still in the making, I sent her a picture of the "Dream Catcher Necklace"
To give her an idea of what they might look like. 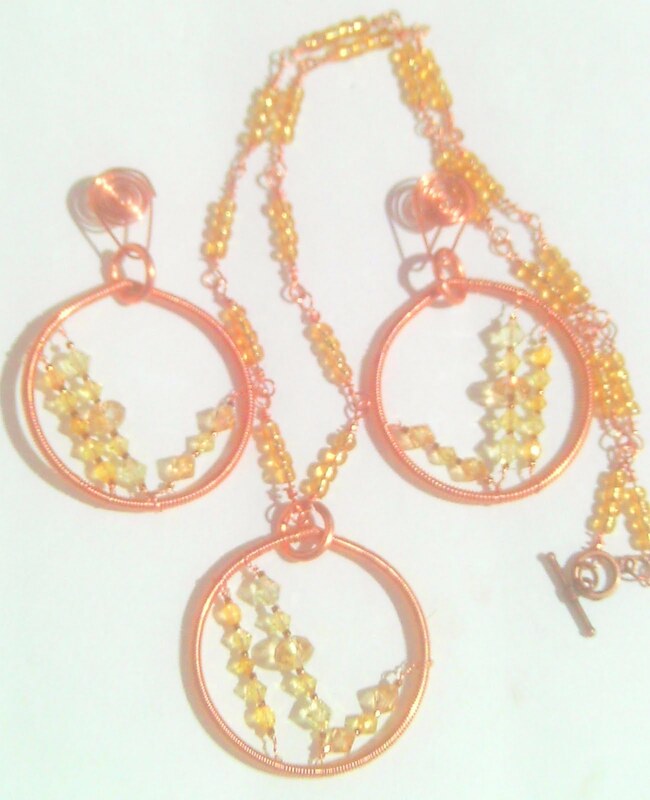 She really liked this necklace and asked if I could do a pair of earrings to match. Well, if you saw my previous post..........no more gold lame thread. So, off the the store I went, and off to another store, and off to another store, apparently, if you want gold lame thread, you better stock up at Christmas time! (this type of thread is used quite frequently for ornaments and Christmas gift wrapping). So, I came up with another hoop design to run passed her. This set does not yet have a name. 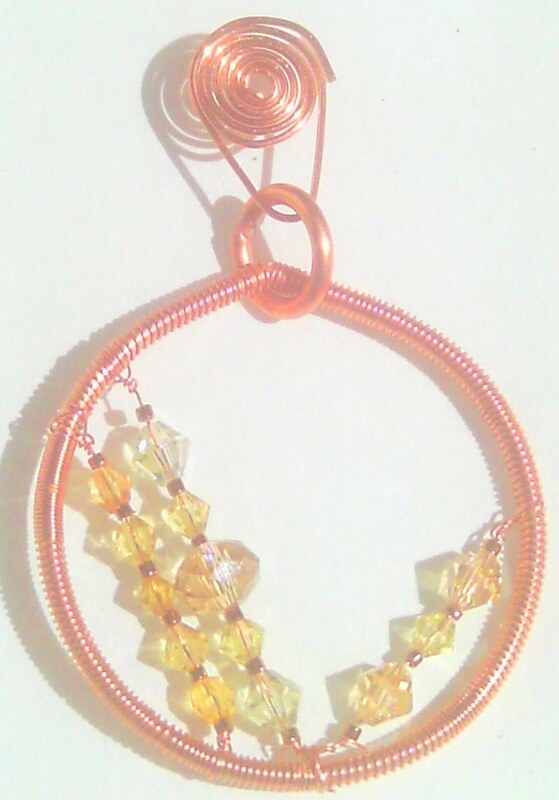 Originally, I was going to hang the pendant on a copper chain but, since everything else was handmade, if figured, What the heck! 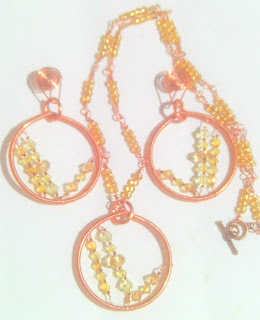 The design inside the hoops are made using various sized bi-cone and rondelle crystals in various shades of gold and yellow along with some very tiny copper seed beads. After photographing the set I sent the pics to her. She really liked the set but was wondering if it would be possible to change the 'random' design into the shape of a 'K', her first initial. WHY DIDN'T I THINK OF THAT!!!!! grrrrrrr. lol. What a great idea I told her. But, I told her, rather than change this set, she could pick the metal, silver, gold or copper as well as the color of beads. 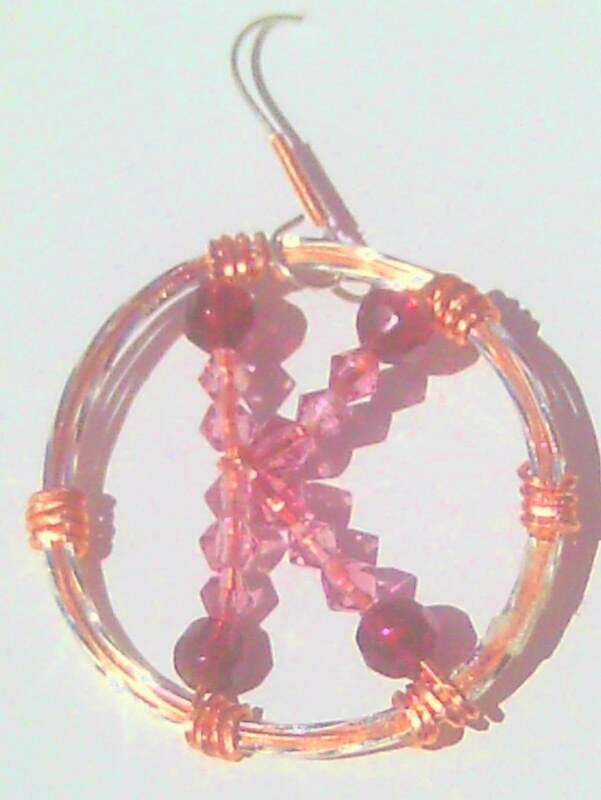 I am now in the process of making her custom order. Silver (using square silver wire, twisted, for the hoops), beads in shades of purple (for the K), and she requested a handmade chain rather than a plain silver chain so, I will be making the chain with links of matching purple beads (maybe seed beads and crystals, not quite sure yet) on silver wire. I will upload the images when I complete her set. 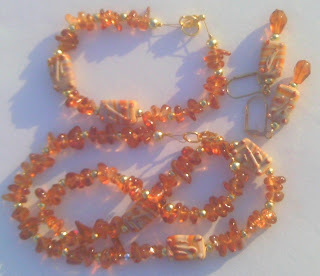 The set above will be available at Nutkitten's Handcrafted Jewelry sometime tomorrow afternoon. HAPPY BIRTHDAY!!! To the "LOVE OF MY LIFE", MICHAEL SLAGLE. Originally, this started out to be a pair of earrings. After making a "guesstament" on how much of the gold lame thread I would need, I knew I had enough for one pair of earrings, no mistakes. 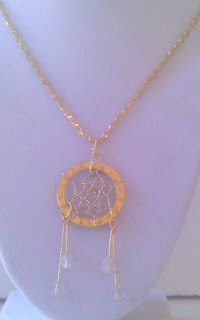 Well, being that the title of this post is "Dream Catcher Necklace", you can probably figure it out...............the "no mistakes" did not happen, lol. So, I added a chain and so was born, "The Dream Catcher Necklace". 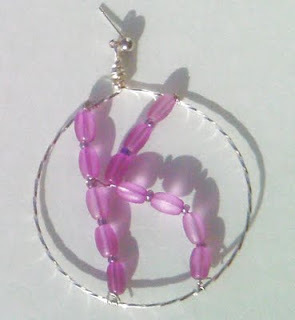 Since it is half passed midnight and I am pretty tired, this item will probably not be available at Nutkitten's Handcrafted Jewelry until tomorrow afternoon, Sunday 06/05/2011. Oops, after midnight so I guess, technically, that would be today, lol.